R (played by Nicholas Hoult) lives in an airplane at an abandoned airport filled with hundreds of other moaning zombies just like him. Day in and day out he shuffles through life with no pulse and no memory of his life before he was dead, thriving on a regular diet of brains. But all that changes the day he meets Julie (Theresa Palmer). There’s just something about her – nevermind that he ate her boyfriend’s brains. Just being around her causes him to feel alive again and it’s contagious. Other zombies start waking up too, proving love really can conquer all. 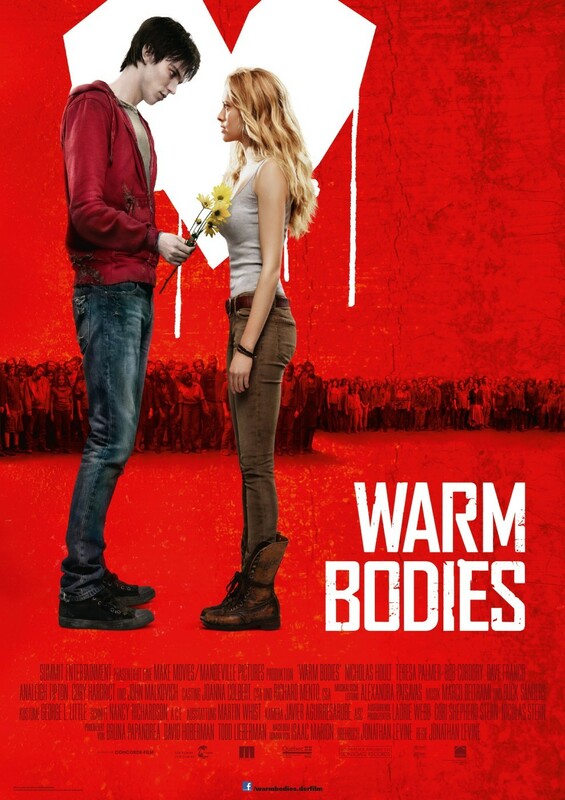 Warm Bodies looked to be be a quirky, zombie rom-com filled with laughs. Unfortunately, we pretty much get a zombiefied version of Twilight. Guess that should come as no surprise since Summit Entertainment is behind both films and the trailers began running before Breaking Dawn, Part 2. Julie is eerily similar to Bella Swan and even sort of resembles a blonde version of Kristen Stewart. She has very little personality throughout the movie. R is pale, dark and brooding – very much like Edward Cullen. All the main characters are high school aged and the film is definitely aimed at a Twilight-loving audience, which is a bit puzzling since the book most definitely is not. Also lacking is the humor. The film tries, but the laughs just aren’t there and the jokes come across as forced attempts at humor. This is probably the most disappointing aspect of the whole film. One bright spot in an otherwise unremarkable film is the fantastic soundtrack. R is a record collector of sorts and music from Bob Dylan, Feist, Guns and Roses and John Waite is played throughout the movie. Warm Bodies made $20 million at the box office over the weekend, so I guess some people were enjoying it. But for those who found it lacking, I suggest watching Shaun of the Dead, a perfect zombie comedy if there ever was one. “Warm Bodies: Twilight for Zombie Lovers | lostbetweenthepages” was in fact genuinely engaging and insightful! Within the present day society that is hard to deliver.